How did Jody Wirawan end up in foster care? How did Jody Wirawan end up in the US if he was born in Indonesia? When is Jody Wirawan’s birthday? Where did Jody Wirawan grow up? 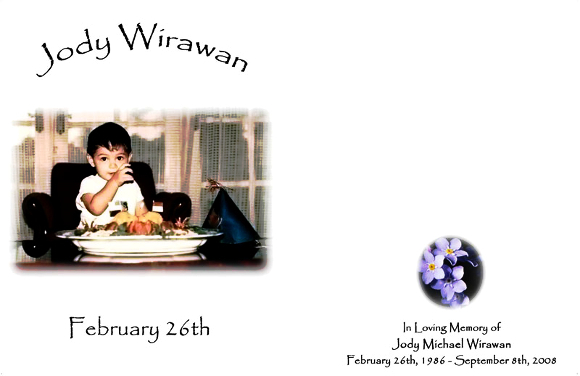 Where was Jody Michael Wirawan born? Who are the brothers of Jody Wirawan? Who are the sisters of Jody Michael Wirawan? Who were the biological parents of Jody Michael Wirawan? Who were the foster parents of Jody Michael Wirawan? Why did Jody Wirawan join the Army? In February of 2009 a memorial card was made to commemorate Jody’s birthday, which falls on the 26th of that month. 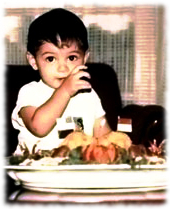 The front of the memorial birthday card for Jody has a picture from his first birthday party, which was held in Depok, Indonesia. Jody loved to eat and couldn’t wait to dig into his birthday feast. If you look closely you can see an American flag on the left and an Indonesian flag on the right as the decoration for the birthday platter in front of him. The back of the card has a picture of the Forget-Me-Not, which is the state flower of Alaska, Jody’s home state. 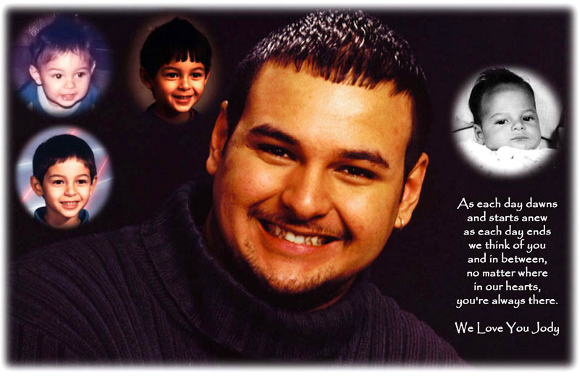 The inside of the memorial birthday card for Jody has pictures from different stages of his life. The main picture in the center of Jody smiling was taken right after his high school graduation. He had extra reason to be proud of his graduation considering how much he had to overcome to get there. An unstable home situation, periods of homelessness, sleeping on the floor of friend’s houses (when their parents would allow it), living in shelters and foster care, as well as having to work the night shift on school days all made it seem like graduation would be unlikely for Jody. There had been so many disruptions to his home life that teachers advised him that he was too far behind to graduate on time with his friends. But Jody was very dedicated and doubled up on his schoolwork, and through hard work and exhaustion he was able to catch up and graduate on time. Definitely something to smile about! WANT THE LATEST FROM THE JODY WIRAWAN MEMORIAL? Hello there, Welcome to the Jody Wirawan Memorial Site!